Centre Bill Tupou will require surgery on a groin problem, ruling him out for up to three months. 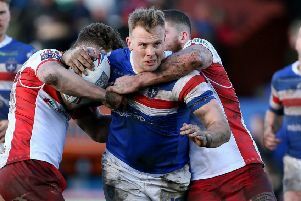 Tom Johnstone is one of five Wakefield players sidelined by long-term injury. The injury has thinned Wakefield's squad further, with Tom Johnstone, Craig Huby, Tyler Randell and James Batchelor all sidelined. Chester admits that he is some way off adding to his side but is keen to bolster the ranks after Wakefield's clash with Huddersfield Giants this evening. "I have been doing some ringing round the last two days," said Chester yesterday. "We are still no nearer to bringing anybody in. There are a few names that have been mentioned but it has got to be a player that has got to add some quality to the team. Danny Brough faces his former club Huddersfield Giants tonight. "It is getting to the point now where we will have to pull some guys back from dual-reg. "We will get this game out of the way, I can have sit down with Michael [Carter] and see what budget we have available. "The salary cap isn't the issue, it is budget. We were a little bit over budget at the start of the year. "We have had a ridiculous amount of bad luck over the last three or four weeks. "I am sure our luck will turn and hopefully we can bring in a player that will add some quality." After a sluggish start to the season, Huddersfield head into this evening’s game on the back of two victories. The Giants thrashed Hull KR 42-8 two weeks ago before a 38-26 win in London last Sunday. Both of those sides have claimed victories over Wakefield this season and Chester is expecting another tough battle. He added: "I think they have been really good the last couple of weeks. "They put a really good score on London last week and we know first hand how difficult it is to go there and get a result. "I thought they were excellent against Hull KR and they put some points on them. "It is going to be a similar game to the weekend's game [against Salford], they are not going to go away and they are a tough team to break down. "They have got two wingers that are exceptionally strong." 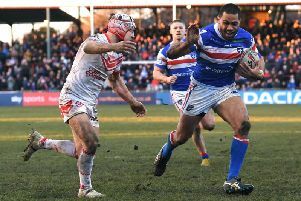 Wakefield sit fourth in a congested Super League table and Chester says anyone can beat anyone. "London have shown this year that they are a match for anybody, they beat us, they beat Wigan, they beat Leeds Rhinos - it is a close competition," continued Chester. "If we can get a win at the weekend, we will just cement our place in the top five which is a target we spoke off in pre-season. "We haven't got any home games in May, so we need to make the most of these next couple of weeks. "We have got Huddersfield, Wigan, Castleford away and Leeds at home. "So that is three home games in our next four. We targeted this six weeks as a really important time and we are two from four at the minute. "We are still not where we wanted to be but we have got a good opportunity now to consolidate our spot in the top five."